An executive at one of the country’s biggest defense companies has bemoaned government barriers to exporting military equipment, as changes to the law have failed to bring the bonus some expected for the domestic industry. 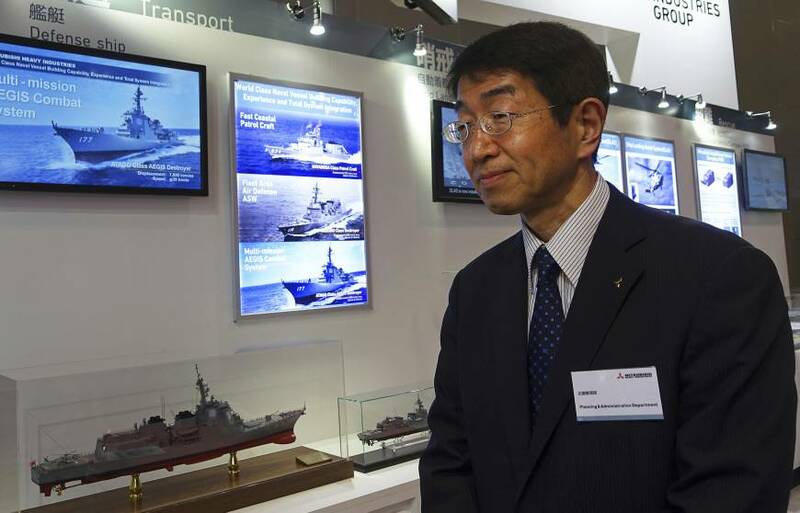 Speaking at Kawasaki Heavy Industries Ltd.’s booth at the MAST defense convention in Chiba Prefecture, the company’s senior manager for its naval ship sales department said the government needed to rethink its required processes. 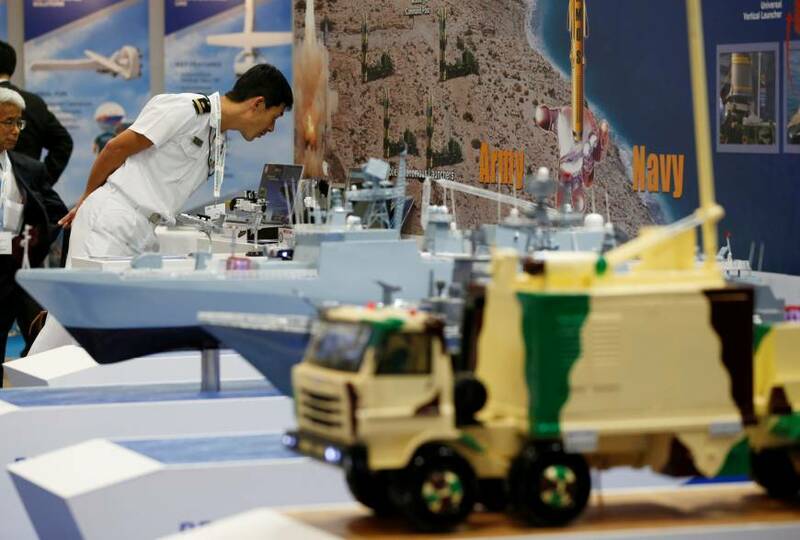 While admirals from foreign navies expressed interest at the conference in adopting Japanese technology, strict guidelines limit defense equipment cooperation to cases deemed by the government to contribute to international peace or Japan’s own security. These regulations add a layer of complexity that’s left Kawasaki’s marine division unwilling to take a proactive stance on exports. The last time KHI exhibited at the conference it was in the running to sell a fleet of the world’s largest conventionally powered submarines to Australia. Two years later, it’s offering a small rescue sub. KHI, along with Mitsubishi Heavy Industries Ltd., was part of a public-private Japanese consortium competing against established exporters from other countries for the $39 billion contract. But Australia’s selection in April last year of France’s DCNS SA as its partner poured cold water on Abe’s ambitions. The bid came after Prime Minister Shinzo Abe lifted a decades-old ban on military exports in 2014 as part of his drive to strengthen the military and deepen international ties amid tensions with North Korea and China. But the long-pacifist country has struggled to win high-profile contracts, turning instead to smaller projects, including joint development and transfers of used equipment to Southeast Asia. Bidding for the submarine deal showed KHI how high the hurdles to export remain, according to Takao and Tetsuji Yuasa, senior manager of the company’s submarine design department. Takao said other problems were a lack of experience in contracts and the inherent risk of working overseas. A potential sale of KHI’s P-1 submarine-hunting plane to the U.K. also failed to materialize. While a number of potential joint projects are at the research stage, only one is officially under way — an updated SM-3 ballistic missile interceptor MHI is working on with U.S. company Raytheon Co. 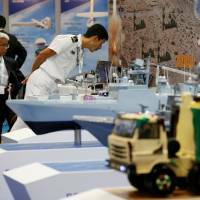 The Acquisition, Technology and Logistics Agency — formed in late 2015 to handle defense procurement, technological cooperation and exports — hopes its presence at the exhibition will help drive home the message that Japan has advanced technology and is able to partner with other countries. Hideharu Yoshio, a deputy director at the agency, said that while selling large pieces of equipment to advanced nations had proved difficult, transfers to less wealthy countries were a way of securing the region and contributing to Japan’s own stability. The nation is leasing five used TC-90 patrol planes to the Philippine Navy as part of this drive. The first steps outside the domestic market have provided lessons even for Mitsubishi Heavy Industries, the nation’s largest defense contractor, according to vice president Shoji Sato. The company realized it needed to work harder on public relations, he said, because it was relatively unknown in the field outside Japan. MHI is working on the next-generation interceptor with the U.S., and researching other projects, but Sato said little had evolved for Japan’s defense exports the past two years. That’s where Kawasaki is hopeful exports of their 12-meter-long Deep Submergence Rescue Vehicle may be uncontroversial enough to meet with government approval. The submarine, which can carry up to 14 people, carries no weapons and offers the capability to rescue the crew of a submarine that becomes disabled in deep water by docking with it under the sea. Only two currently exist, with a third under construction. “It’s a rescue ship, it’s not an aggressive piece of equipment,” said KHI’s Yuasa. arms export, defense equipment, Kawasaki Heavy Industries Ltd.